The old saying goes a way to a man's heart is through his stomach. Latest neuroscience research is beginning to show this old adage rooted in actual science. What goes into our stomachs has neurological impacts in our brain. The way to a bigoted man's heart is also through his stomach. Well even bigoted women. All the snap judgments thrown my way by strangers and family, recent turbaned encounters of designer Waris Ahluwalia in Mexico City, Canadian comedian JusReign in San Francisco and the cantankerous Presidential campaign has really reinforced me to think about what brings me the most joy, food. Here is a menu of flavorful concoctions from my 'Make America Great' concept vegetarian restaurant in NYC where I am hotly seeking a Michelin star. Our chef hails from a lineage of tailors and good for you knows next to nothing about stitching. We offer you a selection of fresh market vegetables and you tell us what tickles your fancy and he will tailor make them to your taste!!! 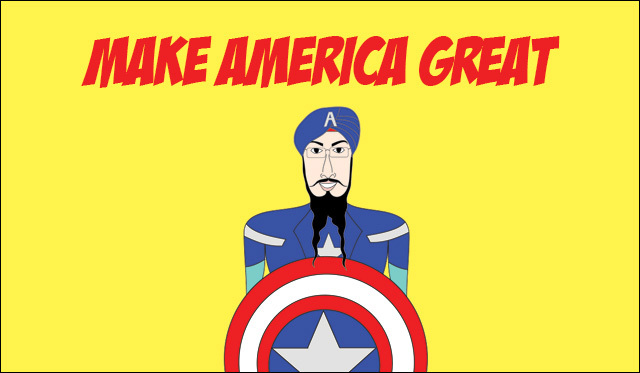 Vishavjit Singh is the nations only turbaned/bearded editorial cartoonist, writer & costume player based in NYC. He was featured in Red, White & Beard, a short film released last year. His works can be consumed at Sikhtoons.com He can be reached @sikhtoons.